My skin is like a battlefield. The forest has completely ravaged it. My ankles are the front lines where chiggers, mosquitos, and ants wage war against my socks. Our campsite swarms with wasps, bees, flies, and ants. Bees have taken a liking to my camera viewfinder, where the sweat of my forehead often drips. Here, in the forest, it sometimes feels like you could be eaten, bit by bit, if you stayed long enough. The insects are less of a problem when I am covered up, but the minute skin is exposed they hone in on the target. 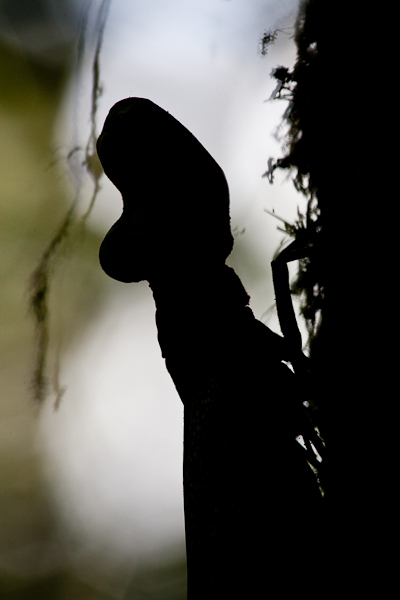 While sometimes a nuisance, the insects are also the most enchanting part of the forest. At night, when I rise from my tent, moths hover in the hundreds above the campsite, glittering like fairies in the faint light of my headlamp. Today, I hiked a new trail the men are clearing. As I reached the top of a hill, I heard “Gabrielea, ven ven!” I saw Freddy waving his machete for me to come. He led me through the trail to a clearing and pointed at a large tree. From a distance I thought the insects on the side where large cicadas. 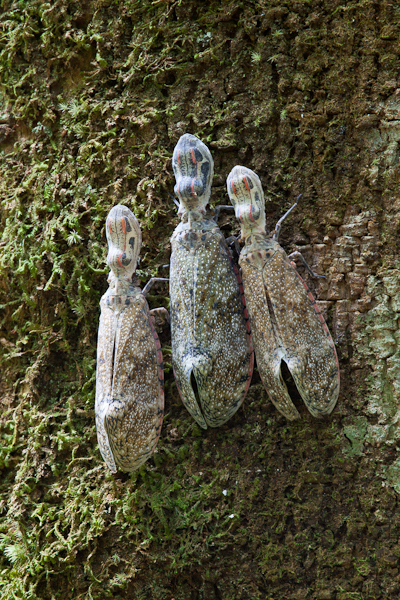 Then, it slowly dawned on me – they were fulgorids – an insect I have wanted to see in the wild since I was 7 or 8 years old. These fantastic creatures have large wings and a head shaped like an unshelled peanut. There were 8 individuals on the tree and the largest ones were almost 7 inches long. Amazingly, they ranged in color from pastel yellow to pastel blue. While I found it difficult to take creative images of them, I did get a few interesting pictures. Then, I put my camera aside and just looked. Their underwings had yellow and black eyespots. 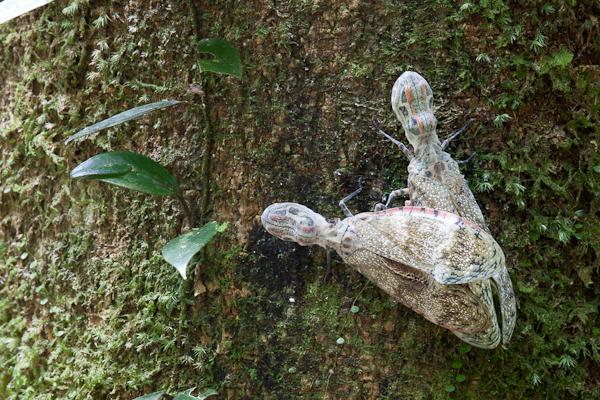 Despite my prodding, I could not get one to fly, but I did see a mating pair. I was thrilled! 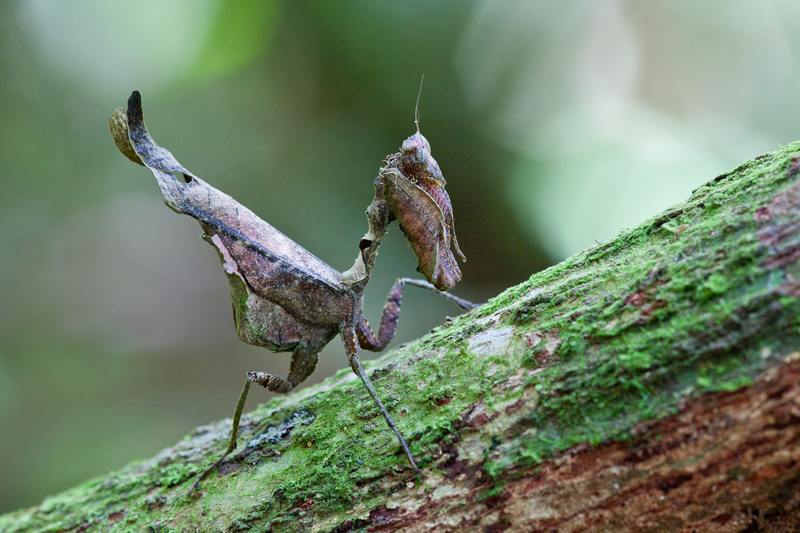 The fulgorid sighting was followed by a dead leaf mantis that hangs upside down and wiggles like a dead leaf in the wind. Its amazing behavior makes it look even more like a leaf than it already does. After that, I wandered through the forest until Freddy appeared once more. This time, it was a bushmaster. The bushmaster is the most venomous snake in this area – I have had many a nightmare about it. However, this would be my first time seeing one in the wild and I was incredibly excited. This individual was about 2 meters long and it was sleeping under a tree in the leaf litter. Until it was pointed out to me, I would have had trouble seeing it. Its coloration makes it blend in perfectly with its surroundings. When I did see it, I was immediately impressed by how vicious it looks. Its whole appearance, from the sharp scales to the angular head, screams “I am a mean devil of a snake.” I took a lot of photos – from a distance. After I finished and started packing my camera up, the men began to move in with machetes. I quickly realized that they were going to kill it. I could not stand the thought of such a beautiful animal, however dangerous, being killed. So, I began to put up a fight. So, I saved the snake. However, Argument #3 was a complete lie. It turns out that the Central American Bushmaster is listed as vulnerable by the IUCN, but the South American Bushmaster is not threatened. Hopefully good intentions justify the lie. 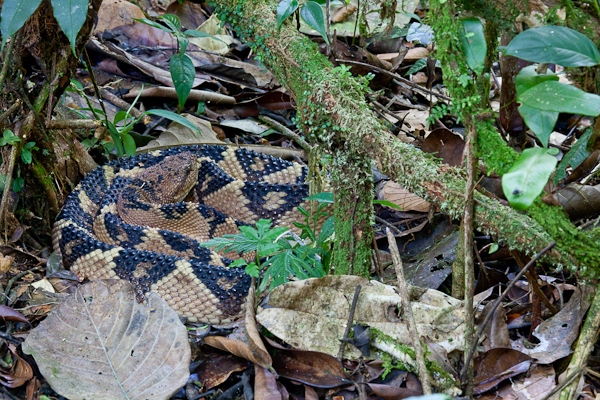 Congratulations on seeing a bushmaster in situ, and in saving it! Nice peanut-head lantern bug shots, too! I’ve never seen an aggregation like that.